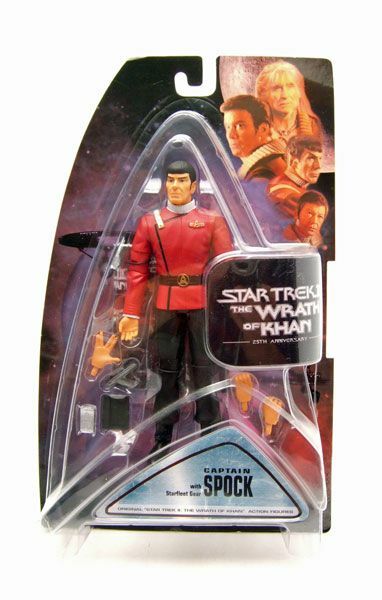 Diamond Select released this Captain Spock as part of it's "Star Trek II: The Wrath Of Khan" line. 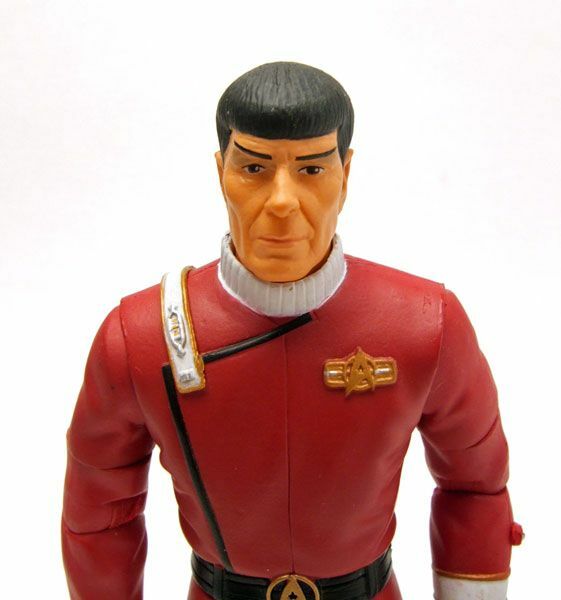 One could argue that Spock is the most pivotal character from "Wrath Of Khan" (hell, you could easily argue that Spock is the most pivotal character in Star Trek period), so the fact that he was missing from the first wave AND the second "Comic-con" wave of TWOK figures was a little distressing. 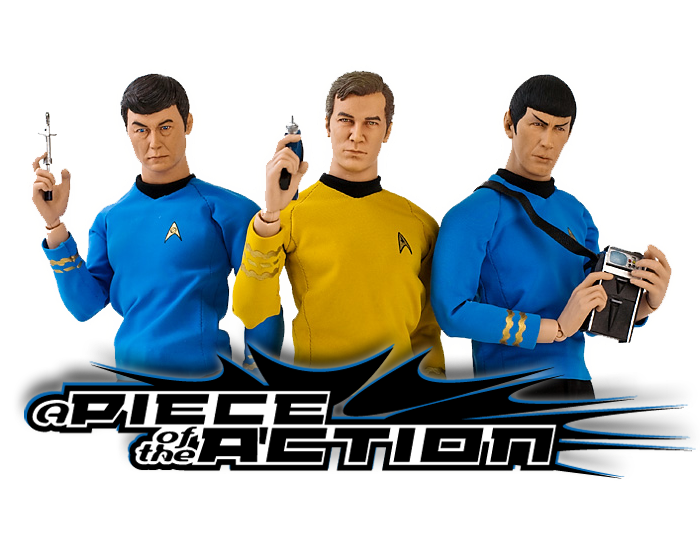 With so many Trek crews left unfinished in figure form, having to wait until essentially the third wave to get a Spock was torture. Obviously, we did get him...and man was he worth the wait! This Spock rocks. As good as the AA TOS Spock head sculpt is, I think this older Spock captures him a bit better. Maybe it's the fact that Nimoy had a little more "character" in his face by this point that made it a little easier to nail the likeness, but whatever the reason the fact is that this is one excellent head sculpt. The only small gripe I have is with the skin tone- it looks a little like Spock has been hitting the tanning beds or he's trying out for the next season of "Jersey Shore". I wish he'd had a bit more of a pale green tint to his skin, but alas, what can you do? As I've discussed in the other DST TWOK spotlights, there is some body reuse between the characters. Not really a big deal, since the uniforms are all basically the same and some minor changes are made to reflect different ranks and divisions. Spock is no exception, but regardless of it being a reuse, the body works. The build is a good match for Spock and the body has a good range of movement without sacrificing the look of the sculpt. 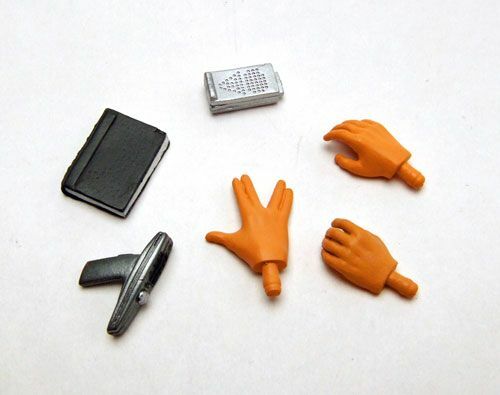 Accessories: Spock includes a phaser, communicator, the book he gives Kirk, and 3 (count 'em 3!) extra interchangeable hands. I'm especially pleased to see the book included- who'd have thought we'd get that! 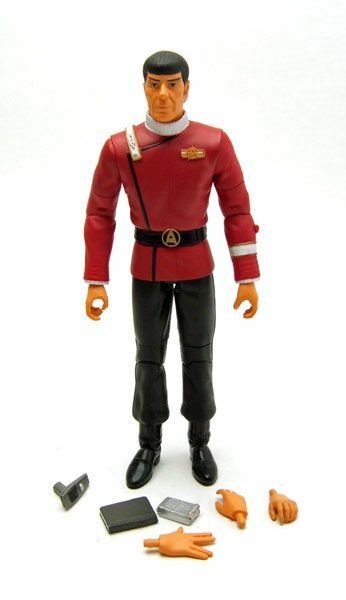 If you are just beginning to collect DST stuff- the "Wrath Of Khan" line is a great place to start, with this figure HIGH on your list of priorities. 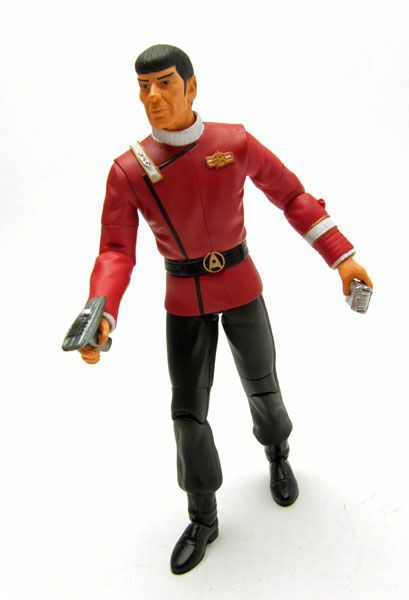 He's a great sculpt with solid accessories and reflects one of the greatest moments in Trek history- even if some punk kid spoiled the end for you. I started collecting AA/DST figures by these TWOK line last year. They really got my attention when i saw some in the web. Then i continued with some TOS, Mirror, Chairs,Pike, Amok, Voyage Home, etc. But they are nothing as good as Twok figures from my point of view. Those uniforms look awesome, head sculpts are great(McCoy, Scotty!) and i really love their shoulder joints. Why didn't they keep on with this design? I mean theres no major differences between jackets and shirts. They could have reused this kind of joints. They are cool. I still dont own this Spock. It has become hard to find in Spain, but you can easily get Kangs ...thats bizarre. I ve got the dead of Spock 2 pack. But its kinda weird.Im not sure if a lIke a Diying Figure.I was thinking about repainting. But no. I'ill keep him original and lauch him to Genesis in a probe. Yeah DST has forgotten Spock is Grey. Same issue wiyh the Amok one. Thanks for the kind words! Sorry to hear you're having trouble finding Spock. If I run across another, I'll let you know! A fine review James. I have a full TWOK crew and believe they feature the best likeness of the TOS cast, with the exception of Kirk/Shatner who could be refined a bit. Anon hope you acquire a Spock sometime. 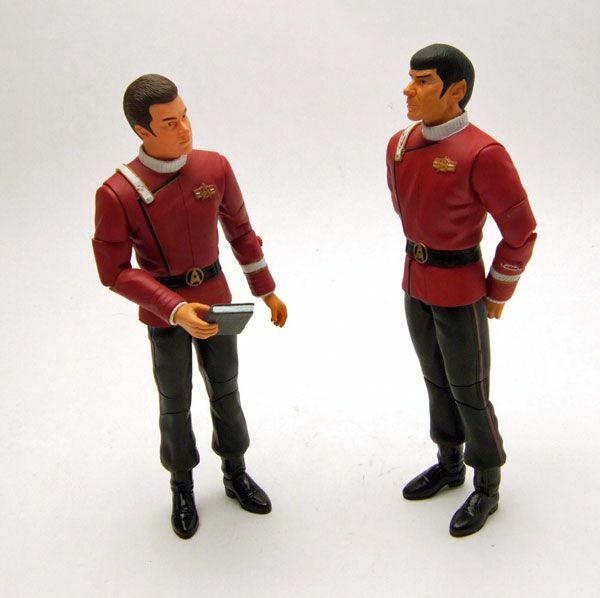 I may post some pics of my A/A figures on Trekspace soon. 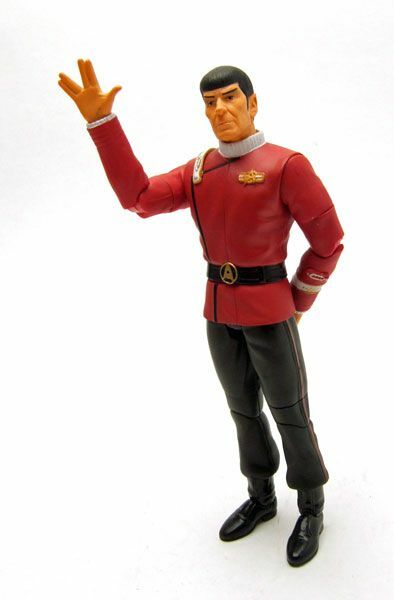 otaku5003, hey james do you have an extra TWOK spock figure i could buy from you? if you do just shoot me an email, thanks. otaku5003 here! Good news i bought a bundle that has Regula 1 Kirk, Captain Spock, Lt.Saavik, and Lt.Uhura for $88.00, i won down and i bought it! and i'm currently having a joy gasm. Thank you so much for taking the time for you personally to share such a nice info. I definitely enjoying every little bit of it. It is a great website and nice share. Discount Perfume & fragrances, Batman figures, Dc superheroes, Collectibles toys, Home, Garden and Tools and body lotions at wholesale prices at CraziestPrices.com. Hey... I Got An Award!